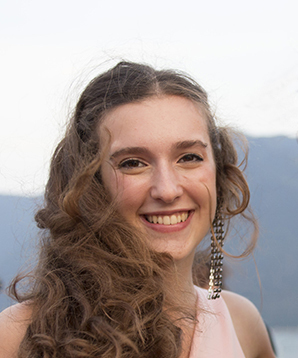 Laura Vecoli ’17 (Italy) has chosen to pursue a Bachelor of Science in International Hotel Management at the world’s top-ranked hotel management school—École Hôtelière de Lausanne—after also receiving offers from each of the other four schools she applied to: London School of Economics, University College London, University of Manchester, and University of Durham. Fluent in English, French, Italian, and Spanish, Laura earned a Bilingual IB Diploma in English and French, capping her three-year career at TASIS by securing an outstanding 40 points on her IB assessment, capturing three of the School’s coveted Graduation Awards—The Salutatorian Scholarship Award, The ECIS Award for International Understanding, and The Award for Excellence in Modern Languages—and delivering an excellent speech at her class’s Senior Banquet. Outside the classroom, Laura served as a Dorm Proctor for two years, traveled to Mongolia for a Global Service Program trip, worked on the crew for The Merchant of Venice, and played the cello for the School’s instrumental ensemble. She was also a member of the Varsity Cross Country and Track and Field teams and participated in a number of recreational sports and activities, including climbing, spinning, and dance. Laura was a member of the TASIS Leadership Academy her junior year, and for her capstone project she designed and implemented a student exchange program between ninth grade students at TASIS England and TASIS Switzerland. The innovative program helped her win the J. Michael Horak Award, which recognizes a junior who gives spontaneously and tirelessly of himself or herself to the many and varied needs of the student body. Laura said she was most inspired by the leadership opportunities provided at TASIS—including her proctorship and her time in the Leadership Academy—and the cultural events the School works hard to bring to its students, such as the Senior Humanities Program, which draws from five of the best elements of the TASIS identity—truth, beauty, goodness, international understanding, and humanitarian action—to provide TASIS seniors and postgraduates with a signature educational experience. The aspects of TASIS that Laura said she will miss the most are the beauty of the campus and the supportive community, and she credits all her teachers for influencing her in one invaluable way or another. She believes she is very well-prepared for the next step.